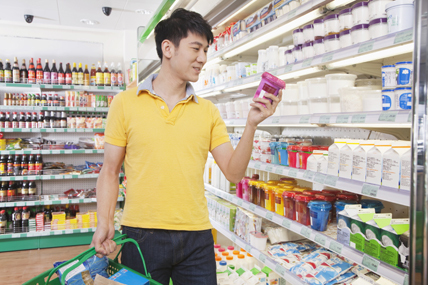 Kantar Worldpanel, the global leader in continuous consumer panels, reports that FMCG spending in China grew 3.6% in the third quarter of 2016. Spending in lower tier cities continued to grow faster than in higher tier cities, especially county level cities and counties which grew by 4.7% and 4.2% respectively. 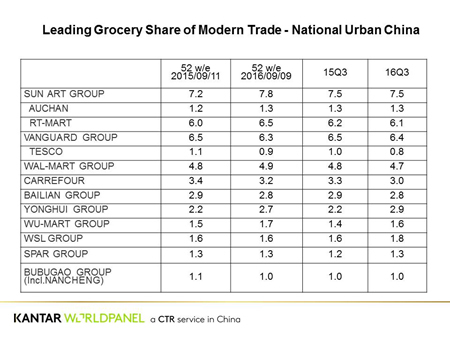 Across China, Modern trade (which includes hypermarkets, supermarkets and convenience stores) grew by 2.2%, slower than total trade. Hypermarkets are now seeing a decline in key and provincial capitals. Hypermarkets declined -0.6% in the third quarter of 2016, compared to same time last year. However, growth for the channel remains strong in the lower tier cities (prefecture cities/county level cities/counties), achieving 3.1% in the third quarter. Lower tier cities offer more opportunities for brick and mortar stores. For e-commerce businesses they present greater barriers, particularly around infrastructure and logistics, compared to higher tier cities. Hypermarket growth in county level cities and counties is driven by Sun-Art Group and Walmart Group, which grew by 28% and 53% respectively in the third quarter of 2016. The West and North regions both outgrew the total market, with gains 5.4% and 5.0% respectively for the latest quarter compared to same time last year. The West region has been growing ahead of other regions since the second half of 2015. This has been driven by infrastructure improvement and faster disposable income growth, as well as by big retailers like Wal-Mart, Yonghui and Vanguard opening new stores. The North region has caught up with the total market after under-performing for more than two years. The strong performance of Sun-Art Group is a contributor to the region’s growth. The total share for international retailers dropped to 11.6% in the third quarter of 2016, compared to 12.1% for the third quarter the previous year. 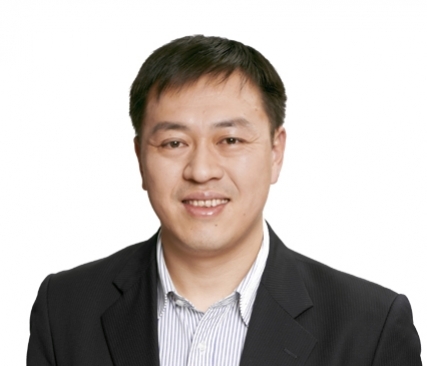 Walmart, the leading international retailer in China, is embracing the omni-channel strategy by increasing its shareholding of JD. From mid-October, Walmart’s share in JD increased to 10.8% and it also opened a flagship global store on JD.com. However, Walmart’s offline share declined 10 points year-on-year. It held 4.7% offline share in the third quarter of 2016. This has been the result of strong competition from local leaders Sun-Art Group and Yonghui. 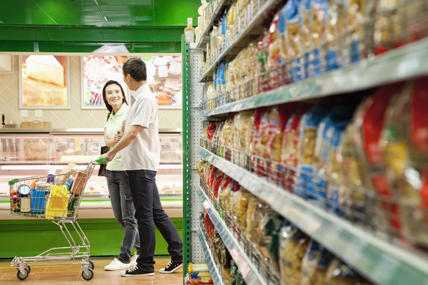 Carrefour, meanwhile, is looking to capitalise on the small format opportunity in China. It plans to open 40 Easy Carrefour convenience stores by the end of 2016 and has put a focus on high quality and private label products. Kantar Worldpanel reports that convenience stores in tier one and two cities grew at 3.9% in the third quarter of 2016, while modern trade grew by just 1.8%. 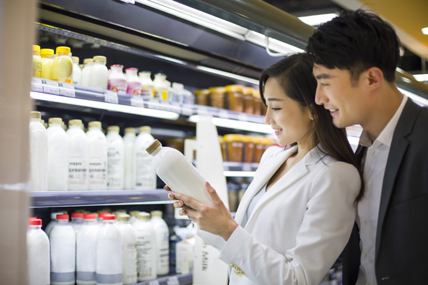 Kantar Worldpanel reports that Chinese consumers’ FMCG spending on ecommerce has grown 63% in the third quarter of 2016, compared to the same period in 2015. 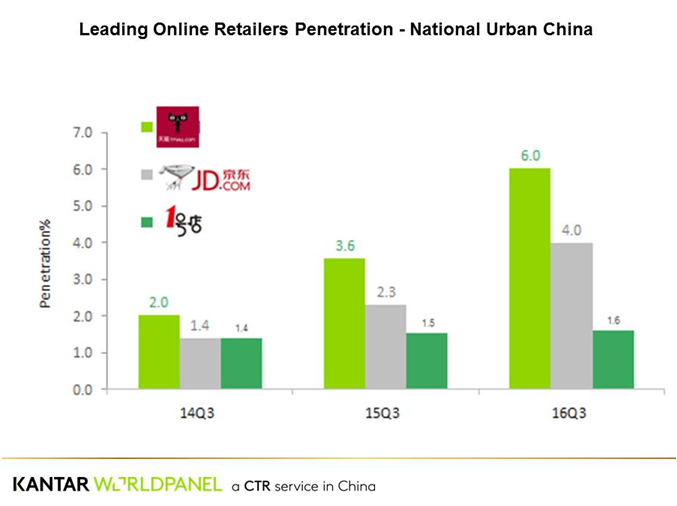 Both JD and Tmall have significantly increased their FMCG shopper base in the last year. Kantar Worldpanel predicts that both retailers will use Singles Day to increase shopper traction and bring their penetration to a new level. Fast growing ecommerce platforms have impacted the brick and mortar retailers, but ecommerce is not the only reason for their poorer performance. According to Kantar Worldpanel data, hypermarket FMCG spending in tier one cities declined -5% in 2015. However, only 15% of the lost spend was switched to ecommerce. The remaining 85% was lost to other offline channels and was a result of consumers reducing their overall FMCG spending in hypermarkets. 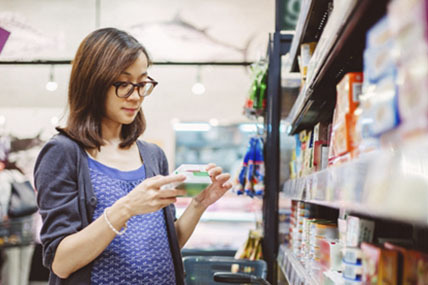 For hypermarket retailers to regain ground, they will need to better understand their shoppers and why they are reducing their spend and choosing to shop in other offline formats, especially in the higher tier cities.